Fiesta Americana Grand Los Cabos Golf & Spa is a Cabo all inclusive resort. Your visit will be defined by exclusivity, luxury and distinction. The architectural design of the hotel offers a breathtaking view of the sea and the desert mountains, letting you feel the magnificence of Baja California’s natural setting. The Fiesta Americana Grand Los Cabos Golf & Spa is ranked #9 on Golf Digest Magazine’s list of the “Top 50 Best Golf Hotels in the World.” It’s the only hotel in Baja California with close and exclusive access to the two Cabo del Sol championship golf courses. After a round of golf, relax at the SOMMA WineSPA. It’s the only spa in Los Cabos and Mexico that uses the benefits of wine in its treatments. Fiesta Americana Resort is perfect for couples looking to escape, but also for families as there is a kid’s club, which is free and apart of your all inclusive experience. There is also many infinity pools for families to enjoy and an adult pool. Fiesta Americana Resort features a premium unlimited luxury all inclusive concept, which delivers an amazing vacation experience. From fine dining restaurants to room service and poolside drinks you will be in need of nothing. Fiesta Americana Resort is unlimited luxury, which means you will only experience quality food, drinks and service. You have access to a gorgeous beach with amazing sunsets. Your beach is a swimmable beach with a wonderful rock aquatic escarpment just to the left of the beach. This escarpment provides a natural habitat for amazing tropical fish. Make sure to ask your pool concierge for snorkel gear to experience this tranquil underwater world. Daily Breakfast Brunch Buffet or a la Carte. Unlimited snacks all day at pool and beach areas. Daily lunch at any of our Buffet or a la carte restaurants. All Buffet Theme Dinners at the resort. Daily dinner at any of our buffet or a la carte restaurants. In-Room coffee and mini-Bar including Bottles of water, Beers and Soft Drinks, replenished once a day. International Open Bar during regular bar operation hours * (soft drinks, bottled water, domestic beer, wine by the glass, rum, vodka, gin and whiskey, tropical-beach cocktails and smoothies). Complimentary snorkeling and fishing gear to enjoy at premises (within the resort) and daily activities program. All taxes, gratuities and service included. Your guest room will be your enchanting hideaway throughout your stay. 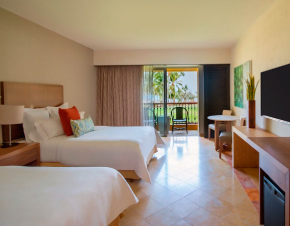 The spacious and comfortable rooms are designed to help you unwind. Enjoy marble flooring and admire the sunrise or sunset from the balcony while you try out one of our domestic or imported drinks from the mini-bar. For anything else you desire, we offer 24-hour room service. Located in the resort’s main building, these rooms have a balcony with views of the pools, gardens and ocean. They feature contemporary Mexican decor, maple wood furnishings, original artwork, glass shower, tub with waterfall spout and wireless internet. This room features a king size bed or two double beds, air conditioning with electronic thermostat, TV with over 40 cable channels, DVD player, full bathroom with shower and bathtub, kitchenette with small refrigerator and microwave and tableware for 4 people. Other room amenities include: AM/FM radio-alarm clock, lighted magnifying makeup mirror, ironing kit, hairdryer, electronic safety deposit box, and coffeemaker. 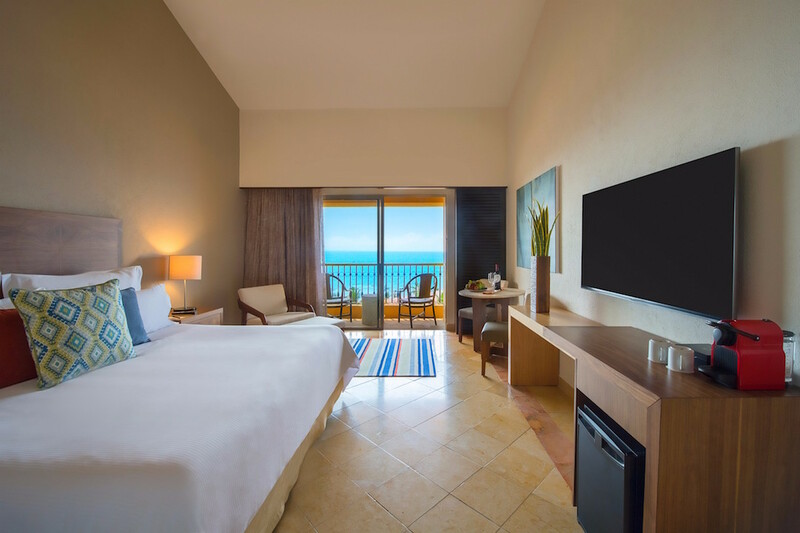 Admire the grandeur of the Sea of Cortez with a spectacular view from your private guest room, setting the stage for an unparalleled vacation experience. 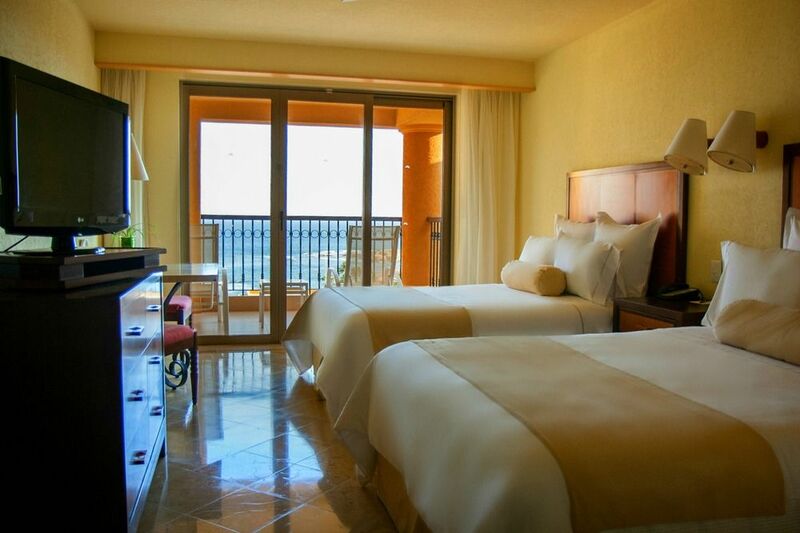 The spacious and comfortable rooms are designed to help you unwind. Feel the freshness of the marble flooring and admire the sunrise or sunset from the balcony while you try out one of our domestic or imported drinks from the mini-bar. For anything else you desire, we offer 24-hour room service. Includes bedroom and the living room, safe box and ironing set. Suite are furnished with a king sized bed with extra cushioning. The living and dining areas are located in a separate room with a full sized sofa bed and dining table for 4 people. Each suite has LCD flat screen with Cable and pay-per-view. The kitchen is fully equipped with state of the art appliances and dish and silverware set. In the bathroom you’ll find marble and wood dressing tables, double sink vanity, a separate shower and hydro massage tub. Distinction and elegance come together in one of the most exclusive suites in the hotel. With its ample spaces, contemporary architecture, and luxurious details and amenities, this suite is designed exclusively for those seeking a first-class stay. Your stay in this suite includes access to the VIP Concierge Lounge, a daily continental breakfast buffet, imported alcoholic beverages, light snacks from 5-8pm, its own pool and exclusive beach with VIP service, as well as personalized Club and Beach concierge. Grand Club brings you both luxury and excellence to be experienced in complete privacy. It is a space of absolute comfort and subtle details that will keep you constantly delighted. 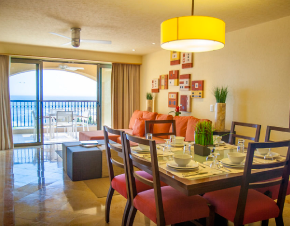 This suite, decorated in ochre and white tones, provides a fresh and harmonious setting to fully enjoy your stay in Los Cabos. Here, you will find everything you need to recharge and prepare for your daily activities: living room area with a TV, bar, vestibule, bathroom, and a bedroom that invites you to completely unwind. The private terrace allows you to admire the view of the Sea of Cortez from the privacy of your suite, where you can take in the impressive scenery, sunbathe, or host a small get-together. In the southernmost tip of the peninsula of Baja California, a hotel destination of fine luxury and warmth has been created. Los Cabos makes the most of nature’s perfection by offering a unique setting with desert, sea and sun in one single destination. Grand Fiesta Americana Los Cabos All Inclusive Golf & Spa was designed for those who desire and appreciate the good life. Delight your tastebuds at one of our eight different styled gourmet restaurants. Sample a selection of local and imported drinks in one of the six bars as well as some of the finest wines. Let yourself be pampered in the expert hands of our therapists at the only spa in Los Cabos and Mexico that incorporates the benefits of wine —winetherapy— to help you relax and beautify your body, the SOMMA WineSPA. Free Wi-Fi access, first-class gourmet cuisine, eight à la carte restaurants, six bars including a swim-up bar, room service 24/7, Coffee Shop, six swimming pools, 4 Jacuzzis, SOMMA WineSPA, fitness center, exclusive access to the region’s top golf courses and facilities for social or business events. Combining the beauty of the Sea of Cortez and the desert mountains, the Ocean Golf Course, designed by Jack Nicklaus and rated one of the top 100 courses in the world and number one in Latin America, is just a few steps from our hotel. Fiesta Americana Resort is an Unlimited Luxury All Inclusive Resort. Guests have full access to all restaurants and bars. This also includes Room Service. What is not included is the Somma Wine Spa, Golf and bottles of wine. Wine by the glass is included. If you desire a bottle it will come at an additional charge. With LuxLife Vacations not only do you get the best available online rate, but also your vacations are curated and customized to you. Your Personal Vacation Concierge is free and will ensure you are in the know with the best of Cabo while saving you time and money. There is no booking fees and LuxLife Vacations provides a FREE CANCELLATION POLICY until the standard resort policy is in effect. We understand that unanticipated events happen occasionally in everyone’s life. Business meetings, project deadlines, flight delays, car problems, snowstorms, and illness are just a few reasons why one might consider cancelling their vacation. In our desire to be effective and fair to all and out of consideration for our guests’ time, we offer our guests free cancelation. We do abide and honor the same cancellation policy that the resort sets forth. Please see below for Your Resort’s Standard Cancellation Policy. Premium Season: Reservations are subject to penalty if the cancellation is received thirty (30) days before the date of arrival. If cancellation is received with less of the time indicated above, The Hotel will withhold the amount of the full stay. In case of “No Show” the charge will also be for full stay. High Season: Reservations can be cancelled with fifteen (15) days prior to arrival date without penalty, if cancellation is received with less time than the mentioned above, the Hotel will retain an amount equal to two (2) nights of stay. In case of “No Show” penalty will also be for two (2) nights of stay. Low Season: Reservations are subject to penalty if cancellation is received less than seventy-two (72) hours prior to arrival and the charge will be an amount equal to one (1) night of stay. In case of “No Show” the charge will be also of one (1) night of stay. 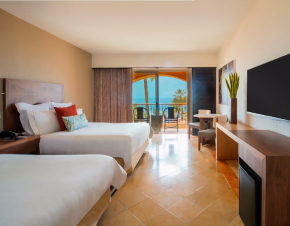 Making the decision to stay at Marquis Cabo All Inclusive Resort & Spa, will be the last decision you need to make for your next Baja vacation.